VersionPB Secret Diary is a password protected digital diary. This Secret Diary is a free software and anyone can download it on their laptops/computers and enjoy writing their entries in the diary . The Diary is known as a Secret Diary because the software is your perfect friend who will keep your secret thoughts forever and shares it with no one . 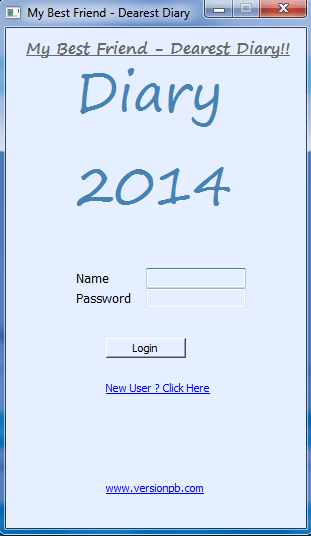 You can create your own username and password for your diary account and login using the same and even if you work on a computer which is shared by many people you need not to worry because this diary needs a username and password to see what s written under it so user should know both username and password to login to their account . From security point of view the software has another big advantage over other similar free software’s that this software encrypts your entries using best security mechanism and then save the same , so you have the peace of mind and you can believe on your Best Friend Dearest Diary i.e. Secret Diary . Secret Diary offers you friend ship today ! Download it and get a Best Friend who will keep all your secrets and will give you full peace of mind . Secret Diary is A Friend who Keeps all the secrets ! Secret Diary or Dear Diary is a Password protected Gadget in which you can create your own username and password and login . All data will be kept encrypted on your local machine which means even if many people use your computer no one can access your Diary Entry or Notes unless they know your password . You can create Diary Entries of Current date , Past , Future date and can see all entries using the search option on the gadget which opens up a calendar for you from where you select date of which you wish to see/edit or create Diary Entry . In case you forget the date when you made your last diary entry you can use Previous Entry button which opens up date when you made last entry . Similarly on Calendar you can use previous button when you want to go to a date where you made entry previous to the date on Calendar .In case you wish to go to next date when you created a Entry . Click Next Button . Whenever you are login you can change your password any time you want .Another nice feature is that you can keep font style and font colour for any day and Diary will remember this setting for of for that day . For example you made an entry on 28th Aug 2013 and selected Arial script of size 20 and green colour and saved it . Next time whenever you open 28th August 2013 you will find Entry in Arial script of size 20 and green colour . 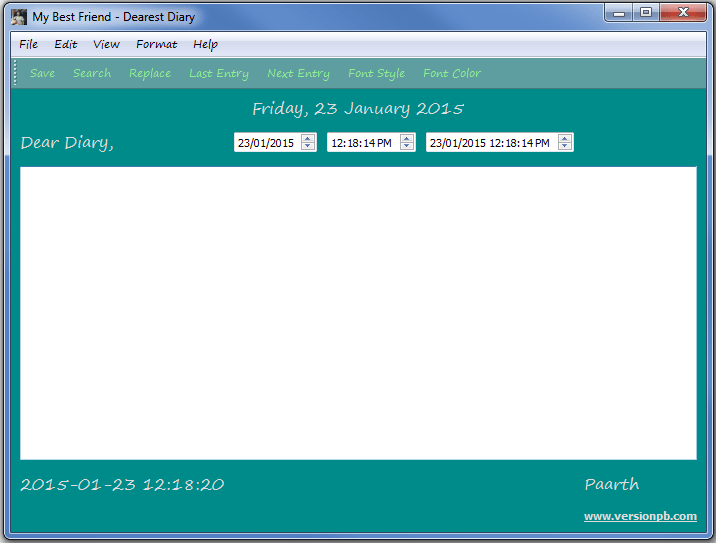 Besides this you can use Diary to make your notes or Year planner or anything which suites you best . Only thing you need to remember is username or password . Your Entries made in one user will be kept for that user only . If you have any suggestions or any feedback or you are interested in the source code or learning how to code your own Secret Diary you can always write to us via contact page .